Love the dress -- such a classic. Happy New Year! Thanks Peter!! Happy New Year to you and Michael as well!! What a great outfit! 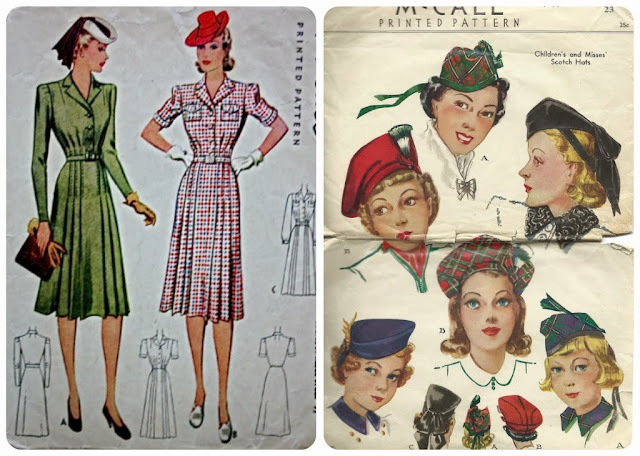 I have a 1940s knitting pattern for a "plaid" jacket with a hat just like that one. Makes me want to go start it right now! Pretty cool your man made you a cap! That dress is lovely and you did a great job matching up the plaid. I too love the sleeve cap detail. And Bravo! to your fella who made such a thoughtful gift and sew it by hand. Who does that? Sounds like you guys had a great Christmas. Wish you a great 2014 as well. Beautiful! What a perfect Hogmanay outfit! Happy New Year! I love the tartan and the hat is my favorite details of all! You look so festive; I just love it! Beautiful!! May God bless your New Year! Really enjoying your blog!! I LOVE your dress! I've never been brave enough to use tartan for anything but a chanter case for my Dad. 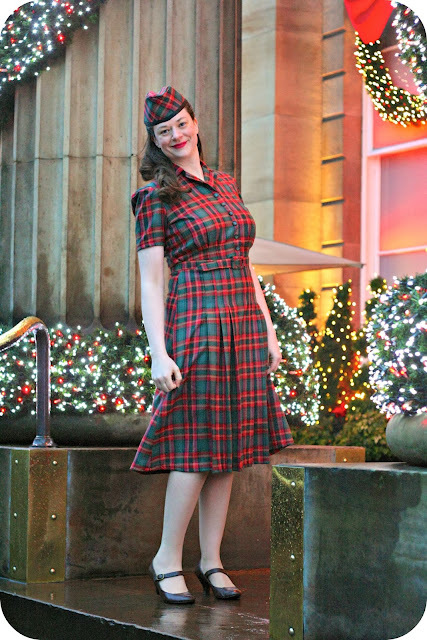 Have a lovely Hogmanay in your fabulous dress! The hat really sets your dress off and you look so polished too, I love it! You are too cute! This is so fabulous! I just love that you and David make things together-- that's awesome! Happy New Year! That outfit is so darling! 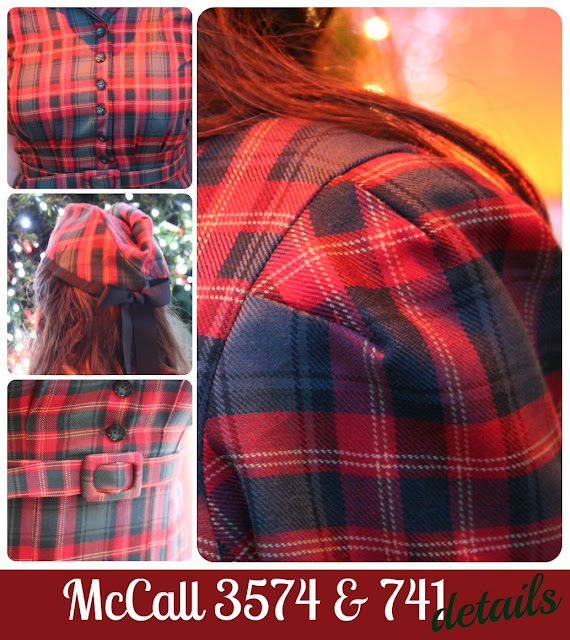 All the details, buttons, belt, and of course the hat, just make it so couture! You always impress me with your 1940's inspired dresses. Happy New Year! As always - simply fabulous! Does a more perfect outfit even exist? You did a lovely job of matching plaids! Have a great 2014! Happy New Year Debi and David, from another Scottish sewist. Your dress and matching hat are fabulous and you even braved the weather to have some beautiful photos taken (outside the Dome?). I'm looking forward to seeing all your wonderful 2014 projects. Your dress is so lovely and the matching hat just completes it! Wishing you a very happy new year. 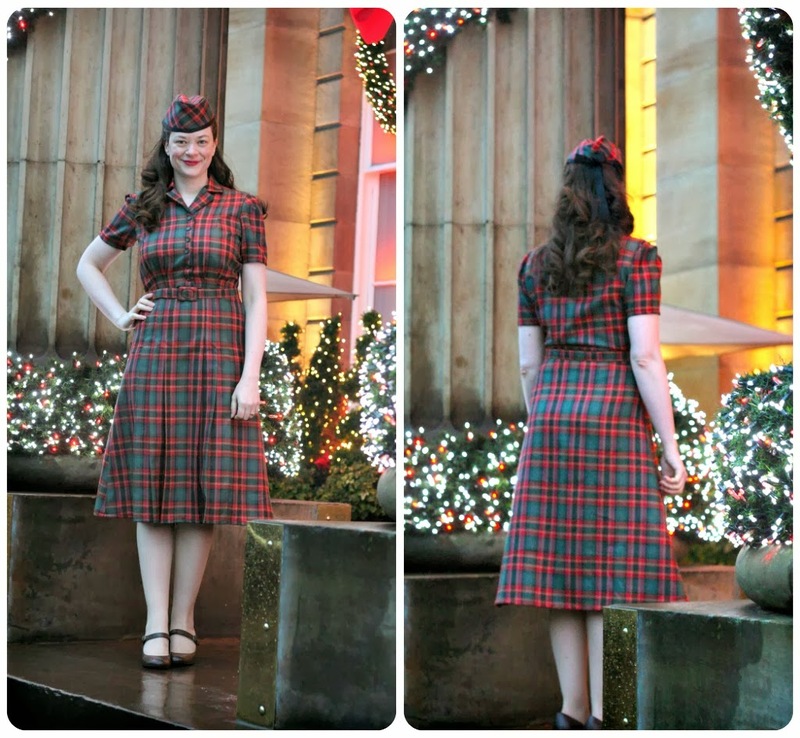 What a lovely Scottish tartin dress for you! One of the first things I noticed was the belt and your sleeves - so perfectly fitted! And what a wonderful gift David made you! I love the back of the hat! Happy 2014 to you and your family! May it be filled with love & joy! Lovely dress! And how fantastic to have a matching hat. Happy New Year. This outfit is lovely, you look amazing. I hope you have a lovely 2014. That is so awesome that you and David make things together. What a super outfit! Thank you and hope you have a wonderful 2014 as well!! Thanks so much Hazel!! I had so much fun making this ensemble! Thank you my dear!!! Have a lovely New Year!! Thank you so much!!! Happy New Year!!! Thank you for the lovely comment! 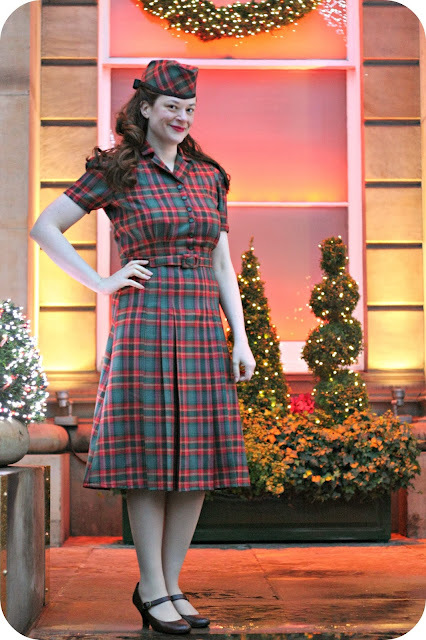 I do love the early 40s style so much! Have a lovely New Year!! Thank you so much!! Have a lovely New Year!! Thank you m'dear…hope you have a lovely New Year! Thank you so much!! 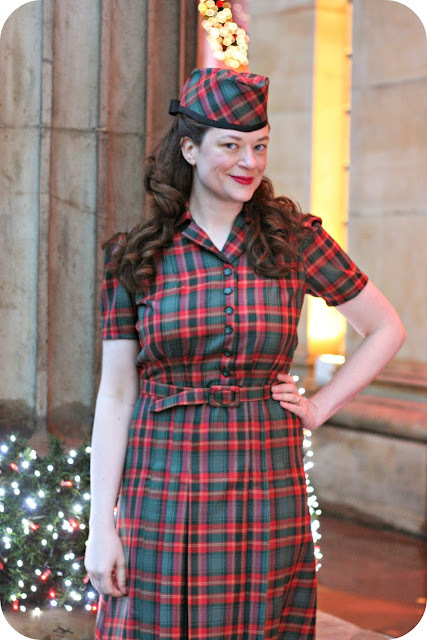 Hogmanay was great this year--hope you have a lovely New Year!! Thanks Stephanie! 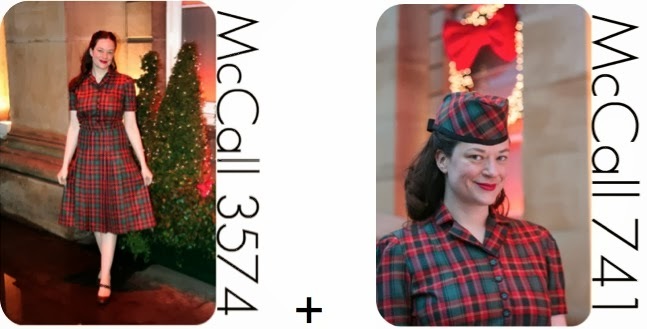 Wow…a plaid knitting pattern? that sounds awesome!! Debi, I've had a *wonderful* time yesterday and today, browsing all your amazing makes! One thing I wanted to mention is how much I enjoy how *wearable* so many of these are, despite being from 74-year-old patterns! 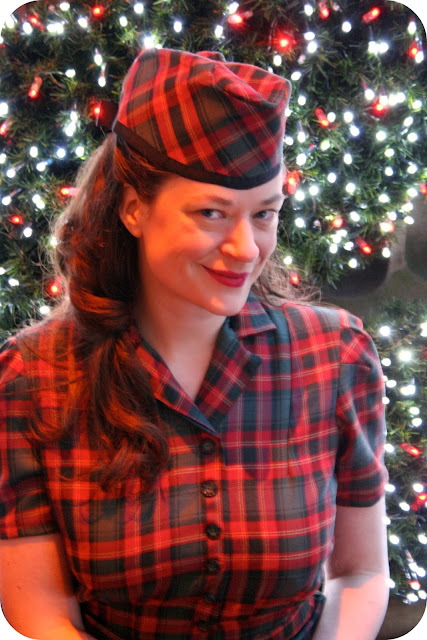 This Christmas outfit is a perfect example -- it's dressy and obviously vintage-y, but in no way costume-y, if that makes sense. I'm also over the moon about your social enterprise fabrics -- I have an idea about social enterprise weaving to try in San Francisco that I will email you about when it's more fleshed out. :) Keep having ALL THE FUN!